Most sailors lay their boats up for the winter and console themselves by reading sailing adventures when outside temperatures drop below freezing; a lucky few head south to the tropics. But when bitter cold persists and the Chesapeake Bay freezes, the “hard water sailors” emerge. Ice thick enough for winter sports doesn’t happen frequently on Bay waters, but when it does, the iceboats begin to appear. On a chilly December 31, 1917, with a high temperature of 9 degrees, Talbot County sailor and boat builder C. Lowndes Johnson, recorded “We have been skating and iceboating all day … I have never known such ice as there is now on the [Miles] river and we are sailing everywhere, but have found a few small places which are not very strong, and these we go around.” Lowndes and his brother Graham constructed their 20-foot stern-steering iceboat in January 1904, but the winter of 1918 provided unequalled iceboating conditions. Like the Johnson’s boat, earlier iceboats were homebuilt. Iceboater Vance Strausburg recalled one made from the former cross at a community church in the Middle River area in the late 1960s or early 1970s. DN class, named for its sponsor, the Detroit News. The winter of 1977 was the coldest in memory for the region, with overnight lows below freezing for 58 nights in a row. Ice closed the Chesapeake and Delaware Canal for the first time since its opening as a sea-level canal 50 years earlier. Barges delivering heating oil were frozen in. Oystermen wielded chain saws to cut holes in the ice directly over the oyster bars and worked from trucks instead of boats. In January 1977, the DN North American Championship, followed by the Gold Cup World Championship, was to have been held in Red Bank, New Jersey, but snowfall there made the ice unusable. 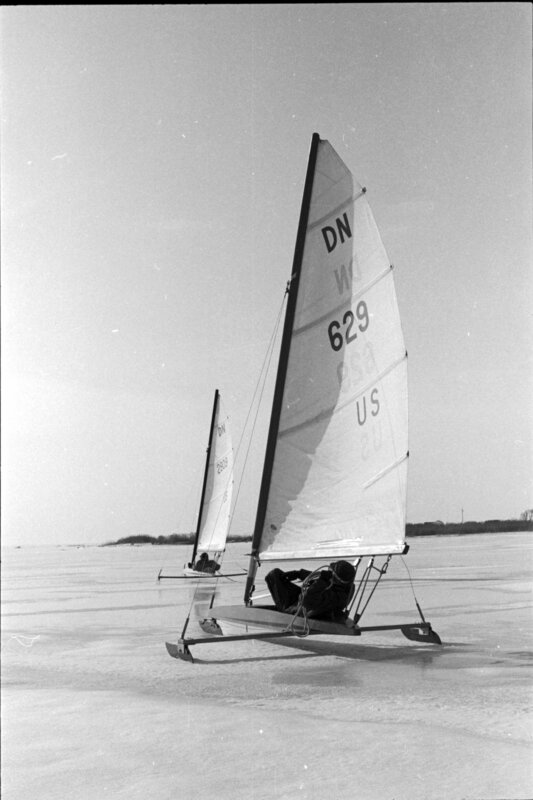 Veteran iceboat sailor Homer Sieder had moved to St. Michaels several years earlier and reported clear ice, so the competition moved south to the Miles River Yacht Club, the farthest south the championship has ever been held. Sailors from the Midwest, New Jersey, New York, New England, Canada, Germany, Holland, and Poland arrived. Three local sailors scrambled to participate, purchasing or borrowing DN class ice boats: log canoe skippers Vance Strausburg and Jimmy Wilson, as well as St. Michaels dentist John Mautz. Iceboating has unique perils, including rough ice and open water. Ice formed on brackish Chesapeake water is softer than that on freshwater lakes. The cold persisted, but by the weekend of February 5-6 pressure ridges had formed in the 8- to 10-inch-thick ice. Hitting the ridges spelled catastrophe for about ten of the 98 boats registered for the North Americans, especially at speeds of nearly 60 miles per hour attained in the 20 knot winds with gusts to 25. Capsizes not only damaged the boats, but catapulted sailors onto the ice, resulting in injuries. On the first weekend of sailing, iceboater Stan Nadler of New Jersey broke his nose when his boat fell into an open-water hole that had formed where the tide ran faster. Mautz qualified for the finals in the North American Championship but didn’t finish the third race when a port tack sailor failed to give way and collided with him. He told Washington Post reporter Angus Phillips, “It all happened so fast” and Phillips noted that Mautz “still didn’t know who it was” at the end of the day. The North American championship concluded on Monday, February 7, with Michigander John Schuch winning the five-race final series. The following day, the World Cup got under way, and Henry Bossett of Red Bank, NJ, took the honors. “so it’s super safe, other than crashing and bruising,” according to local sailor Roger Pickall. “If the ice is talking to you, if it’s groaning, if it’s pinging, if it’s making noise, you’re on good, solid ice,” says Pickall. The Miles River is regarded as risky, because of the greater depth and current under the ice, which will open holes—often in the same places that caused problems in 1977. In February 2015, two iceboats went through these holes on the Miles River. While the sailors were rescued promptly, recovery of the iceboats had to wait until the following day. Pete Lesher is a log canoe sailor and chief curator at the Chesapeake Bay Maritime Museum in St. Michaels. He lives in Talbot County with his wife and two Bay-soaked children.